Looking across the Providence River toward downtown Providence, with the Crawford Street Bridge in the foreground, around 1906. Image courtesy of the Library of Congress, Detroit Publishing Company Collection. 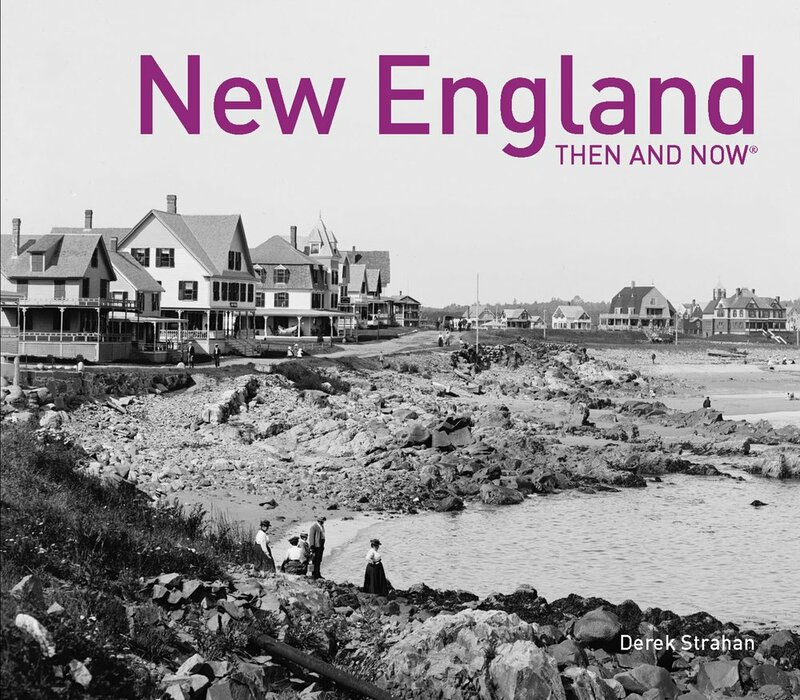 This is probably one of the rare instances when the “now” photo of a city actually looks better than the “then” photo. The first shows a growing city with a mix of new and old buildings, with a skyline that is marred by overhead wires in the foreground. 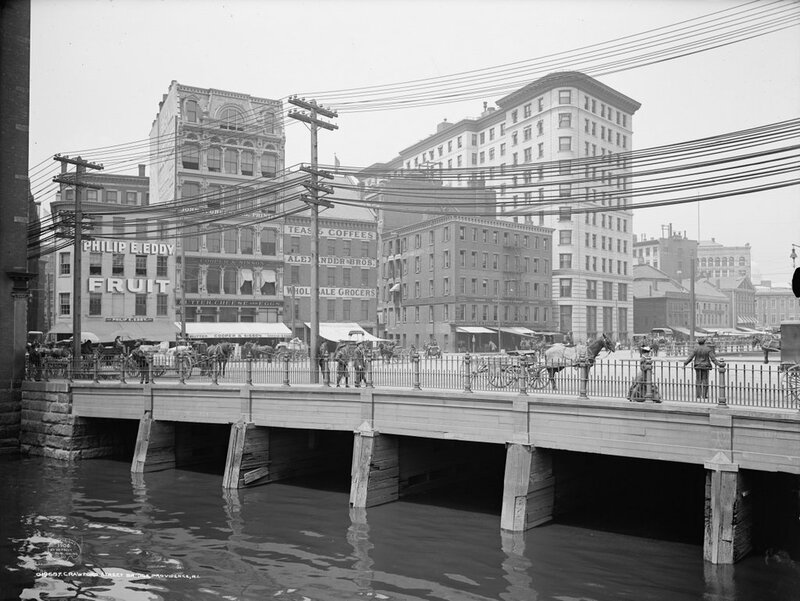 The Providence River was little more than an open sewer, carrying human waste as well as industrial pollution from factories further upstream. By the early 20th century, the river was largely covered by the Crawford Street Bridge, whose southern end is visible in this photo. It eventually earned a spot in the Guinness Book of World Records as the world’s widest bridge, extending upstream for about 1,150 feet, or nearly a quarter mile. 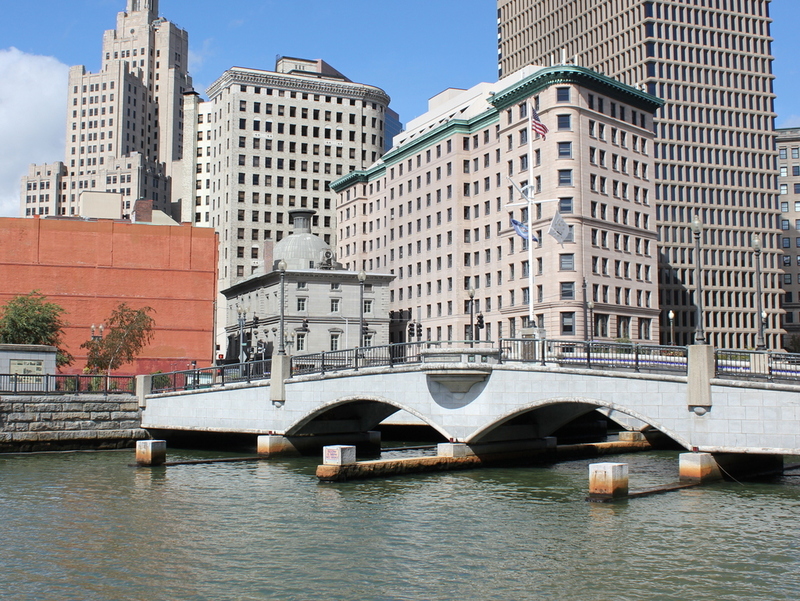 This bridge largely hid the river from view in downtown Providence, which was probably all well and good considering that the smell of sewage in the river reportedly caused some people – perhaps Victorian women in tightly-laced corsets – to faint from it. 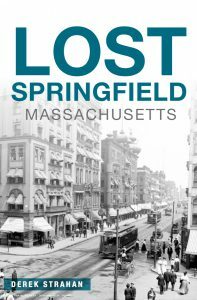 Most of the buildings in the first photo date to the mid-19th century, but perhaps the newest at the time was the Banigan Building, the tall building on the right side of the photo. It was built in 1896 as the city’s first skyscraper, and was owned by and named for businessman Joseph Banigan. Born to a poor family in Ireland in 1839, Banigan and his family came to the United States in the 1840s during the Potato Famine. Here, he became the archetypical rags-to-riches 19th century industrialist, eventually owning a successful rubber company along with other business interests, including this building. The Banigan Building is still standing in the present-day scene, and it is joined by several other historic buildings. Just to the left of it is the old Customshouse, which was completed in 1857. It was obviously there when the first photo was taken, but was hidden by other buildings at the time. Two taller historic skyscrapers stand just beyond the Customshouse. Immediately behind it is the Turk’s Head Building, which was the tallest skyscraper in the city when completed in 1913, and to the left is the Bank of America Building. This Art Deco skyscraper was completed in 1928, and at 428 feet high it has been the tallest building in Rhode Island ever since. Aside from the skyline, the most significant change to this scene has been the Providence River itself. The massive Crawford Street Bridge, its world record notwithstanding, was demolished in the late 1980s, reintroducing the city to the long-hidden river as part of an urban revitalization project. Today, the river is spanned by a series of smaller, more ornate bridges. The river itself is much cleaner than it was a century ago, and now offers gondola rides along with being the focal point of Providence’s regular WaterFire events.